Karen emailed me to let me know she received the ornament I stitched for her for our ornament exchange. 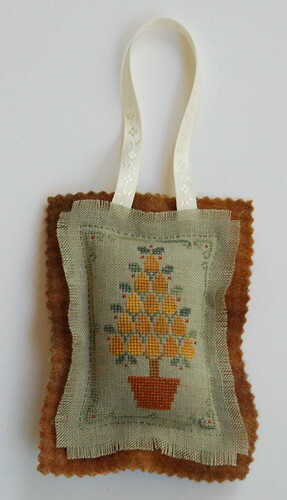 I stitched Little House Needleworks "Pear Tree" from the 2006 JCS Ornament Issue. The linen is 40 ct. Vintage River Willow and the threads are Crescent Colours (I used Desert Mesquite instead of Joshua Tree) and DMC. I used Ruth's Finishing Method - my favorite way to finish ornaments! The felt is WDW Houndstouth Pecan. I have been working on HoHRH - trying to get house four finished up by the end of April. Hopefully I can do it. I really want to stay on schedule with this one! This block is not my favorite though. The colors aren't my favorite. I'll post a pic tomorrow. What a pretty ornament-the colors are great. Gorgeous ornament, Nicole! And wonderfully finished. Very pretty, great job Nicole!!! I love how this came out -- it's so pretty! Your finishing is really wonderful! Colors are lovely in this, Nicole. Great job...oh and you can get that square done, I know you can! So cute Nicole! You did a great job finishing this! 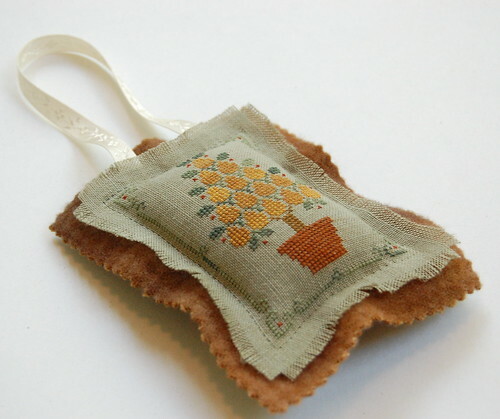 Your stitching is so pretty - an adorable ornament. What a sweet ornament! :) Love the colors!!! Very pretty. And a nice finishing idea. Beautiful ornament, Nicole, and incredible finishing! Looks great! What a darling ornament. I love the way you finished it. Thanks for sharing. What a great ornament Nicole ... I'm sure it will be much appreciated! Such a pretty ornament Nicole. I love the finishing on it too! Oh Nicole, this ornament is soooo beautiful! Well done! Your finish is adorable - I love this ornament! So cute! Again, you've given me good ideas. Love the ornie! That is so cute and your finishing for it is just great! I love it! I love how you finished your ornament. it is even more beautiful in person! i love it!! !